Charlie Spencer says he was unenthusiastic when work started on a short bike trail in Boulder Junction in the 1990’s. Today Charlie is the town chairman in Boulder Junction and a 40 mile trail extends all the way from his town down through Sayner to St. Germain, and west to Manitowish Waters. Campsites at Crystal Lake State Campground have to be reserved way in advance. Enthusiasm is a mild way to describe how Charlie feels about the bike trail. “I own and operate an art gallery in downtown Boulder Junction, and have seen my sales increase at least 20% just in the month that the trail between Boulder Junction and Manitowish Waters has opened. I have customers every day who come into my gallery with bike-riding gear on, praising our new trail section and the entire system in general. These people are incredibly impressed with the quality and beauty of the trail, and vow to return with friends in tow to enjoy our beautiful area. “The Forest Lake Country Store has been in business for over eight years. Our business is primarily a family style restaurant but we also have a retail store adjacent to the dining room. At the start of our business we were the west end termination point for the Wilderness Lakes Trail. “At the onset of our business eight years ago the existing bicycle trail brought business to our store. Families would either start or end their ride with a meal or snack at the Forest Lake Country Store, possibly bottles of water or nutritional drinks for the ride, on a good day some Chocolate Shoppe ice cream at the end of a ride. “In the last three years, significant improvements have been made to the Wilderness Lakes Trail and each one has propelled our business forward. Quite honestly we were fearful of trail expansion. The extension from Forest Lake Road to Deer Farm Road took away our lofty position as an “end of the trail”. We were proven wrong. As the trail has expanded, our business has grown tremendously! More people, predominantly families, were using the expanded trails. The next year, signage, benches and gates were added to the trail and our business soared again. “Last year significant improvements were made that connected the east end of The Wilderness Lakes Trail north of Land O’ Lakes to Watersmeet. Our business continued to prosper as even more bikers, both families and organized bicycle rides, travelled to see and explore the expanded trail. Food, drinks, and other package goods are purchased by patrons enjoying the bicycle trail. “With luck, we receive advance notification when the organized bicycle clubs plan their Vilas County rides. Business is so robust on those days we require additional staff to service the bicyclists’ dining needs. Further improvements to all bicycle routes in Vilas County will enhance all business in the surrounding communities. The sentiment from regular trail users is that they cannot wait to return next year to see what is even better than this year. The users return with more friends and family members to ride new sections and enjoy the serenity of the north woods. These studies listed here provide solid statistics and analysis that supports why Town Chairman Charlie Spencer feels so good about the value of the trails around Boulder Junction. Good recreational and economic planning maximizes the use and continued appeal of trail infrastructure. 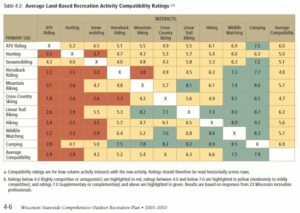 Experts speak about good recreational planning in the Wisconsin SCORP Report - 2011-2016. The Cheese Country Trail case study shows the important usage realities of motorized trail usage and how that drives off non-motorized uses on the same trail. 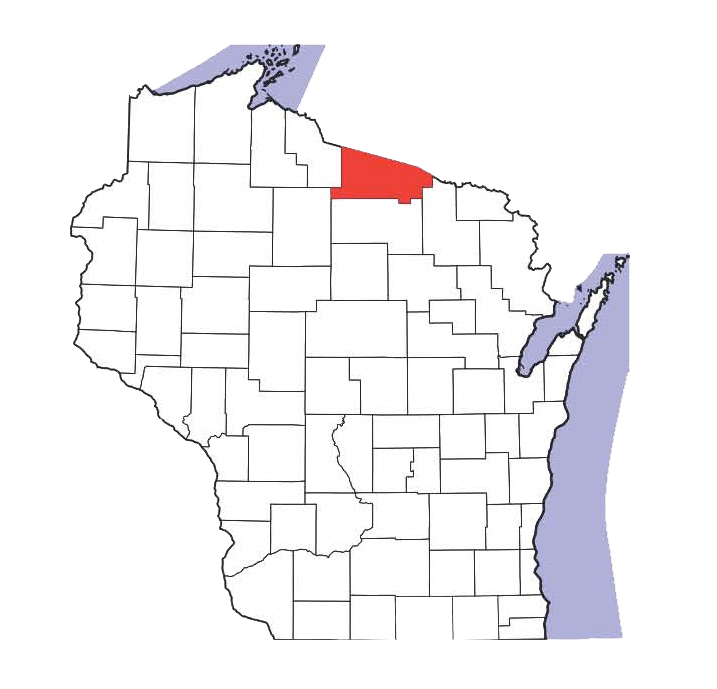 A 2010 study out of the Nelson Institute for Environmental Studies at UW-Madison. Some key findings: Half the people in Wisconsin ride bikes for recreation (that’s about 3 million people), and the direct annual economic impact of bicycle recreation and tourism in Wisconsin is estimated to be $924,211,000. This very useful study focuses on the market-based benefits of the Cheese Country trail. The basic reality of these types of multi-use trails is that they are motorized trails. As this report notes on pp. 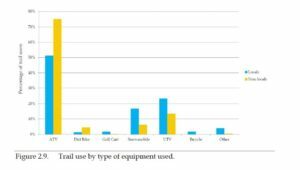 8 & 9, “motorized uses tend to exhibit asymmetrical competition with non-motorized uses…Thus when combined, motorized uses tend to dominate and drive off non-motorized uses on the same trail.” The graph below is from page 26 of this study. People who want a non-motorized trail experience just aren’t attracted to motorized, multi-use trails. Less than one percent of those using the Cheese Country Trail each year are riding bicycles.